So how does prevention work when it works, and what can be done when tried and tested practices fail? In this book, I. William Zartman offers a clear and authoritative guide to the key challenges of conflict prevention and the norms, processes and methods used to dampen and diffuse inter and intra-state conflict in the contemporary world. Early-stage techniques including awareness de-escalation, stalemate, ripening, and resolution, are explored in full alongside the late or crisis stage techniques of interruption, separation and integration. Prevention, he argues, is a battle that is never won: there is always more work to be done. The search for prevention - necessary but still imperfect - continues into new imperatives, new mechanisms, new agents, and new knowledge, which this book helps discover and apply. 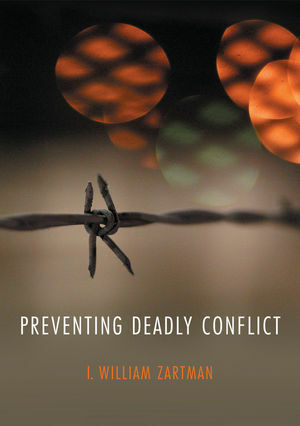 "The publication of Preventing Deadly Conflict by I. William Zartman is a valuable addition to this crucially important field. He has been a leading scholar in this field for years and has made fundamental contributions. This book will have much value for years to come." "In this very timely work, Bill Zartman argues that the mechanisms to head off and contain potentially deadly conflicts in the world have to date been largely effective. But sustainable prevention in a fast changing world demands that they be constantly reinforced, improved, and adapted, and negative containment needs to give way to positive solution searches. Rich with real-world references, Preventing Deadly Conflict explains the why and the how of more effective practice."